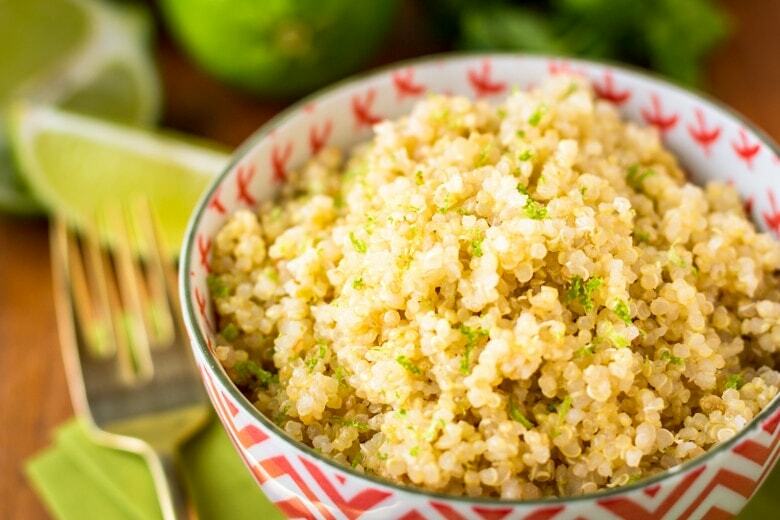 Just 3 ingredients and insanely easy prep (use your rice cooker or Instant Pot) make this delicious coconut quinoa with lime zest recipe a go-to side dish or breakfast option… Total winner! Basically, it’s a riff on our favorite (and very popular) coconut milk rice recipe, substituting quinoa for the basmati rice. Sounds good, hmm? And it’s good for you, too! Not only is quinoa high in protein, it’s also packed full of antioxidants, high in fiber, AND naturally gluten free. So many benefits wrapped up in one delicious, versatile and incredibly easy to prepare grain! With just three real ingredients (because salt and water don’t count, right? ), this coconut milk quinoa recipe is a cinch to prepare, especially when you use my easy quinoa in rice cooker method. Yes, really… You CAN make quinoa in your rice cooker! Just a word on coconut milk… While you could probably use your favorite coconut milk beverage in this recipe, I prefer to use canned coconut milk when cooking. It provides loads more flavor and a richer consistency. But if you wish to opt for the coconut milk beverage, quinoa is always cooked at a 1:2 ratio of quinoa to liquid. So you’d omit the water and use 2 cups of coconut milk beverage in lieu of the canned coconut milk and water in my recipe. You could also substitute coconut water using this same method. 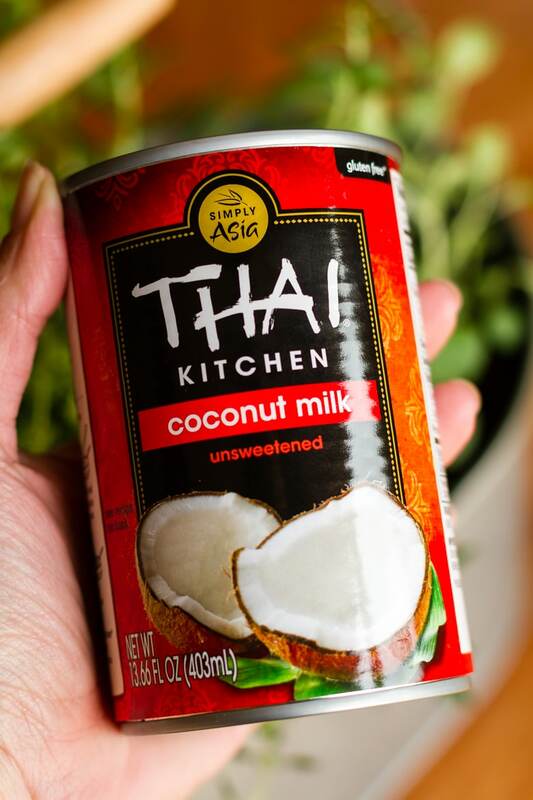 By the way, my favorite brand of canned coconut milk is Thai Kitchen — organic if I can find it, but the regular variety will do, as well. 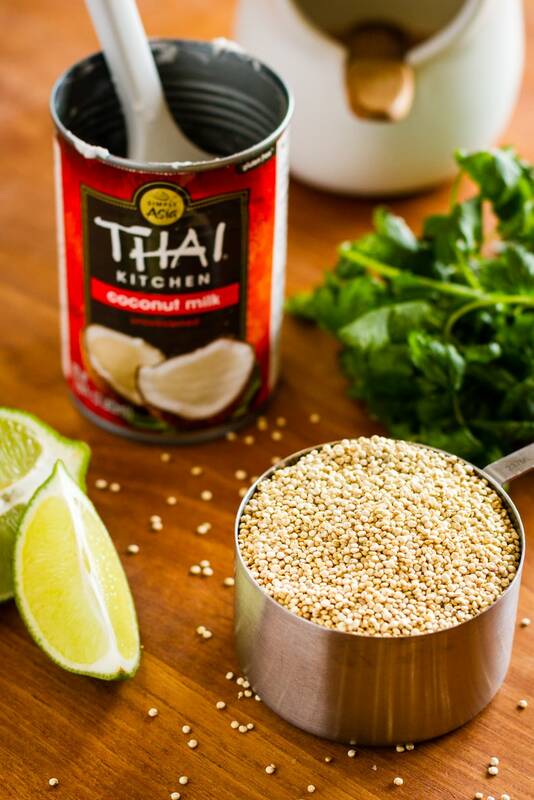 I stock up via my monthly Subscribe & Save order so I always have some in my pantry (because we make this yummy quinoa and coconut milk recipe often). Although I’ve been finding it for a great price at Costco lately, too. So if you’re a big Costco fan (like me! ), look for it there. How you prepare this coconut quinoa is totally up to you. You CAN choose to make it on the stovetop (instructions below) — it’s actually slightly quicker. But it’s just so darn insanely easy to make it in a rice cooker. Simply dump the quinoa, coconut milk, water, and salt in, and push the start button. Then you’re free to throw together the rest of your meal while it cooks. I have a fancy Zojirushi model, but a bargain rice cooker, like this uber budget-friendly model, will more than suffice. For about $16, you’ll adore the overall time savings! I alternate between methods depending whether I’m meal prepping or preparing it for dinner alongside a longer cooking dish. Instructions for both methods can be found in the recipe card. 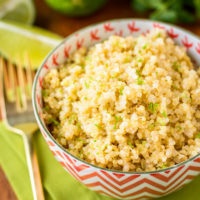 Not only is this coconut lime quinoa a versatile side dish (served alongside chicken, in burritos, in salads, mix in fresh veggies, basically any way you’d normally use rice), the mild flavor with just a hint of sweetness means that it’s perfect for breakfast applications, as well. Topped with coconut flakes, fresh blueberries, toasted pecans, and a dollop of vanilla yogurt, it makes for a surprisingly delicious breakfast bowl! PIN IT NOW! 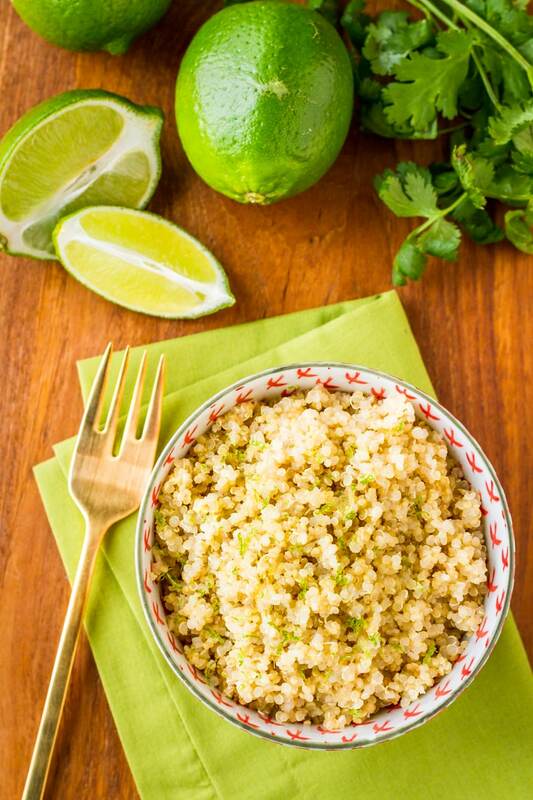 CLICK HERE TO ADD THIS COCONUT QUINOA RECIPE TO YOUR HEALTHY RECIPES BOARD ON PINTEREST! Check the quinoa package to see if your quinoa needs rinsed. If it does, pour 1 cup of quinoa into a fine mesh strainer and rinse thoroughly with cold water. Place quinoa, canned coconut milk, water, and salt into the rice cooker. I select the quick cook setting on my rice cooker, and then press the start button to start the cooking process. For a standard rice cooker without all of the bells and whistles, one cooking cycle should be enough to do it. The rice cooker will beep after about 30 minutes to indicate that it's done cooking. Let the quinoa set for about 4-5 minutes after it's done cooking, and then fluff it with a fork. Stir in the zest and juice of one small lime, season with additional salt to taste, and it's ready to serve. 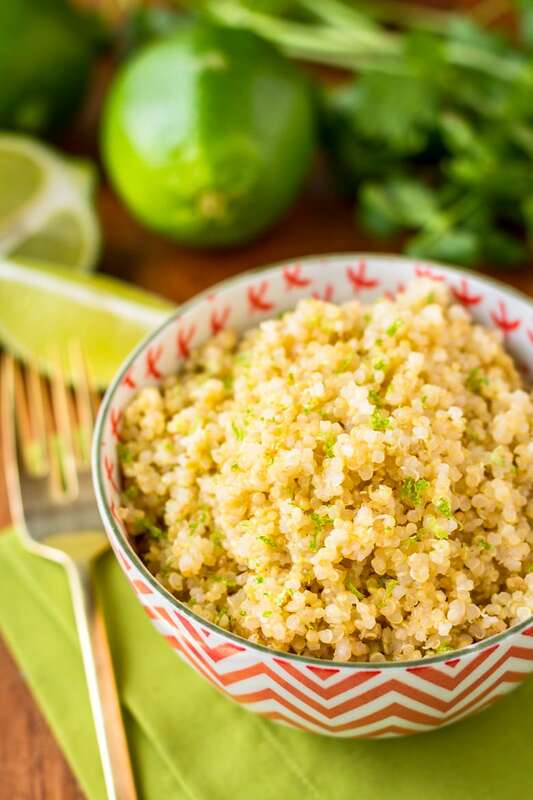 Instant Pot Coconut Quinoa: To cook quinoa in your Instant Pot, simply follow the instructions for rinsing the quinoa, and place all of the ingredients in the instant pot liner. Use the manual setting to cook it for one minute at high pressure (really!) and then allow it to natural pressure release for up to 10 minutes. Fluff and stir in the lime zest and juice as indicated above. Stovetop Coconut Quinoa: To cook quinoa on your stovetop, simply follow the instructions for rinsing and place all of the ingredients in a saucepan. Bring the mixture to a boil, cover with a lid, and simmer on low for 15 minutes. Let the quinoa set for about 4-5 minutes after it's done cooking. Fluff and stir in the lime zest and juice as indicated above. To substitute coconut milk beverage or coconut water for the canned coconut milk, use 2 cups of either and omit the water in the recipe. Note: I've had a few people remark on Pinterest that they thought their coconut lime quinoa turned out bland. This is why seasoning to taste is SO important, folks! Season with additional salt after cooking, and add more lime juice until you're satisfied with the flavor. With just 4 ingredients and only 30-minutes of baking, these amazing baked boneless skinless chicken thighs are sure to become a weeknight staple. Winner, winner, chicken dinner!!! This delicious spicy shredded Instant Pot salsa chicken recipe is equally perfect for weeknight dinners and weekend meal prep! It’s easy to prepare, super versatile, and freezes well. Just 4 ingredients and under 40 minutes prep to table! 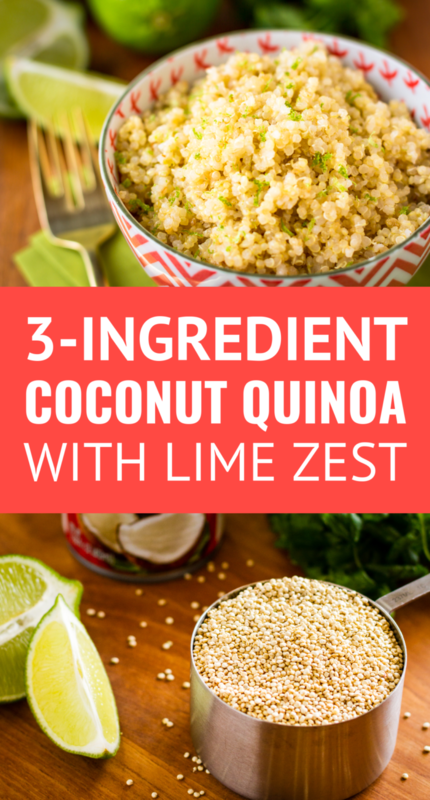 I’d love to see how your coconut lime quinoa turns out… Tag me @Unsophisticook on Instagram or use the hashtag #Unsophisticook so I can check it out. Enjoy!